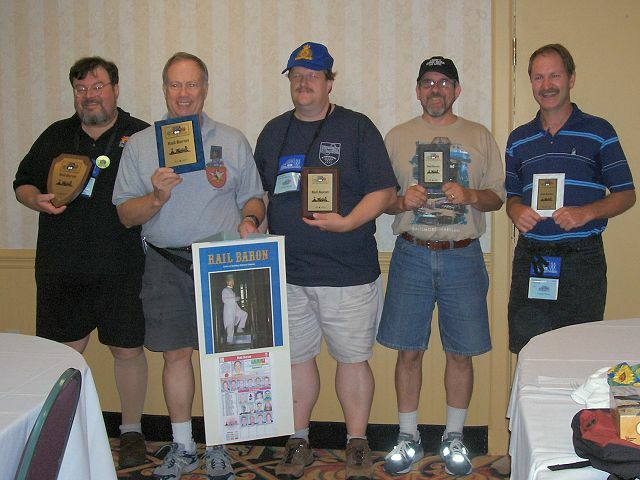 A new Rail Baron champ was crowned at the 2007 World Boardgaming Championships. The suspects, that is, finalists from a field of 40 line up for a picture; from left to right: Tom Dunning (champion), Ron Secunda (GM), Norm Newton, Chester Lanham, and Mark Kennel. Picture courtesy Paul Van Bloem. Congratulations to Tom Dunning, this year's Rail Baron champion. No stranger to railroad boardgames, this railroad owner/engineer out-steamed, out-bought, and out-rolled his rivals in a game that ended in a slightly calmer finish, compared to many earlier tournaments. Finishing second was yours truly, your GM, Ron Secunda. Coming in third was Norm Newton, and fourth, Chester Lanham. Chester made it to the Final by winning a Semi-Final game that he was seated at as an alternate. Finishing 5fifh and last was Mark Kennel, who appeared to be having lots of fun and really enjoying the game in spite of struggling. Speaking of struggling, as usual, I suffered from really pitiful dice rolls, at least during the first 3/4 of the game. It was so painful, Norm gave me his dice to use and Mark even rolled one region and city destination for me. Of course, I didn't own a Northeast railroad, so naturally, he rolled Portland, Maine as a destination for me (Thanks for trying, Mark). As you can see, it was a very friendly game. Rail Baron Tom Dunning owned the following RR's: PA, UP, SOU, MP, and RF&P. I owned: ATSF, SLSF, ACL, GM&O, C&NW, and NP. I also had the N&W, which I had to auction off. Norm held the NYC, CMST&P, SP, IC, and my N&W. Chester held the B&O, CRI&P, D&RGW, GN, L&N, NYNH&H. Mark had the C&O, SAL, CB&Q, T&P, WP, and B&M. This year, only 40 players hit the rails, and no one player won all three first-round-heats. Only one player, Paul Bean, won two of them, so everyone who made it into the Semi-final (with two exceptions) did so by winning only one first-round-heat. The two exceptions were Chester Lanham, who was seated as an alternate, and Alexandria Henning (the defending champion's daughter), who graciously sat in as an emergency alternate when another player gave up their seat at the semi-final. The first two unfriendly destinations rolled were Boston by Chester at the end of Round 9, and Albany by Tom in Round 10. Since Norm had bought the NYC in Round 7, the table consensus was that Norm was doing well. This thinking was reinforced when Mark again rolled Portland, ME in Round 15; he owned the B&M, but had to take Norm's NYC to get from the C&O to the B&M. Tom rolled Detroit in Round 21, but was careful to take Mark's C&O rather than Norm's NYC. Mark was clearly trailing, and true to form ended in fifth place, but the others seemed to be pretty close. However, the power of the Pennsy became evident as the game continued. Mark paid the PA to get in to Pittsburgh in Round 29, and again to get out in Round 30. Chester paid in Round 38 on his way to Portland ME; his good rolling let him get away with paying Mark's B&M only once, and he paid the NYC on his way out. Meanwhile, Tom managed to avoid rolling many unfriendly cities; he had three in the first half of the game, but his next unfriendly destination was his home city of Albany when he went home and won. Tom announced going over $150k in Round 48. Since no other player was much over $100k, this led to immediate jockeying for second place. Surprisingly, players paid to ride Tom's UP and PA to avoid paying another player, with the result that Tom arrived in New York in Round 57 with $237k. Ron arrived in St. Louis and announced he had broken $150k, but Tom had no trouble rolling a 2 to reach his home city of Albany on the next turn. Mark Kennel: $71 + 76 = 147. Thanks again to Paul for the Final report. Additional details of the Final game will hopefully be available at the Rail Baron Fanatics website. Thanks again to my assistant GM's, Paul Van Bloem and Chester Lanham, to my wife and Chester's wife for their assistance, and to all the players who make this such a fun event!